I get asked this question a lot: is ‘Tween Waters Inn all-inclusive? You won’t find many all-inclusive resorts that include meals in Florida — it’s just not very common. But what I love about ‘Tween Waters Inn especially, is that the resort doesn’t have to be all-inclusive for you to never leave the property! The really great thing about ‘Tween Waters Inn is you can dine — breakfast, lunch, snack, dinner and dessert — all within the property’s restaurants and snack shops, and if that leaves you wanting more, their studios, suites and cottages contain kitchens to whip a quick meal too! I always start my day with breakfast over at Captiva House. I spring for the warm full breakfast, because while the homemade pastries, fruits and yogurt are deee-vine, I like to start my day with something to warm my insides, like their buttermilk pancakes or breakfast quesadilla. Both are reasonably priced at under $10, and I’m willing to swing for something so delicious and filling. After that, I’m usually off to the beach to walk off the meal, and then I head on over to the pool for a little sunning. By lunch, I’m hungry for a wrap from Oasis Pool Bar. Surprisingly, for pool bar food, these are awesomesauce. I am actually craving a chicken caesar wrap right now. Vacations are meant for splurging, so of course I’m going to order up some ice cream from ‘Tweens Beans — the coffee and snack shop window at the South end of the pool area — to cool off. Dinner comes in a variety of options, and depends on my mood. Sometimes I’m really just in the mood for a pizza or grouper while I listen to a little live music, so I head on over to Crow’s Nest. Other times call for a decadent meal (usually when I haven’t snacked all day at the Pool Bar) at Captiva House. While you’ll find it has a formal elegance about the food (and fancy piano player), it’s a casual atmosphere that still allows me to be informal, and maintain my “no worries” vacation mentality. I basically love everything on the menu, but I can’t help myself — even if I’m not hungry, I still have to start off with a bowl of blue crab bisque (a customer favorite). After that, I’m usually pretty adventurous and will try different entrees each time, but my go-to has to be the spicy ahi tuna or seafood risotto. Okay, so yeah, when I’m on vacation, I’M ON VACATION. I might have mentioned that a few times. So of course I’m going to finish the day with delectable tuxedo cake. I’ll walk the whole Captiva Island for another day of great food like this from ‘Tween Waters Inn. You and your ‘other half’ have arrived and it’s finally time to relax. 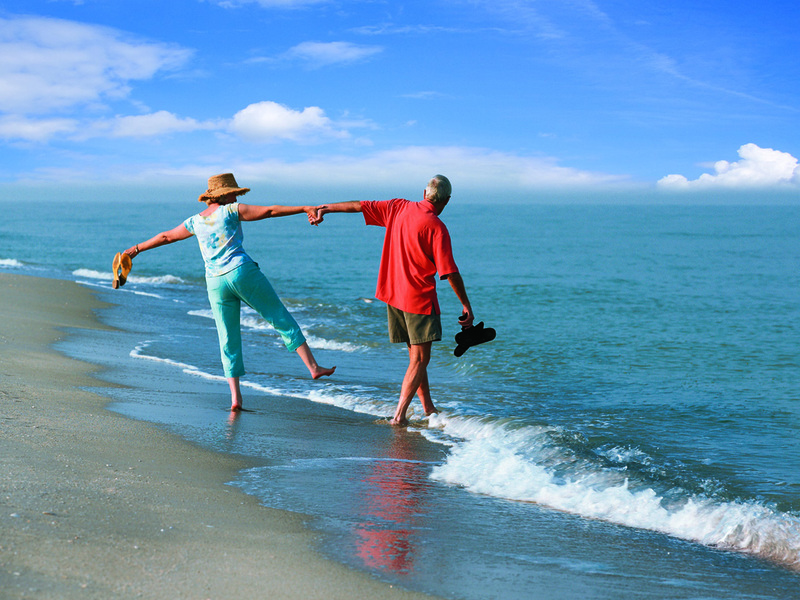 With hours of enjoyment ahead of you take off your watches because now is the time to chill and get familiar or reacquainted with the unique, ‘Tween Waters Inn you are delighted to call home while you spend time on Captiva Island. Begin by taking a carefree stroll together around the property that stretches famously from the Gulf of Mexico to the Bay. Get some sun on your faces and a little wind in your hair while discovering the places you both want to locate and return to during your visit. Head to the Oasis Pool Bar on the south side of the resort, meet the bartender, order a fruit drink, take a peak at the Bar’s restaurant menu, and spend a few moments taking in the sights. Across the pool deck you’ll see the children’s area, hot tubs and the poolside Tween’s Beans shop where specialty coffee and frozen treats are served all day. Visit here also to pickup the most popular and necessary pool items ranging from cotton t-shirts to a new pair of water wings. Look up to the 2nd floor to find the Spa At ’Tween Waters. Take the stairs to enter the Spa or the Resort’s Fitness Center. Make appointments if you like, and also look for the quiet lanai located beside the Spa. It’s an out of the way place where you can relax for a few minutes protected from the sun almost anytime during the day. As you leave the Spa go west and you’ll be walking by the Shuffleboard and Bocce Courts, as well as directly toward the resort’s Private Beach on the Gulf of Mexico. Go all the way to the beach now or save this promising adventure for another carefree walk. From the entrance of the resort off Captiva Drive, look for Captiva House restaurant. This is where guests dine graciously for breakfast, and again during the evenings in gourmet-style. Step inside to make dinner reservations and browse the gift shop. Make a note of the outside seating area here that offers a place to share a meal or simply take it easy in the shade under cover. INNSIDER TIP: Guests who stay two or more nights receive a $100-value resort coupon book, where they enjoy $5 off a $30 purchase or more at both T.H. Osprey Gift Shop and the Pelican’s Roost — ‘Tween Waters Inn’s on-property gift shops. You have also arrived at the famous Crow’s Nest Beach Bar & Grille located right next door. This is ‘the place’ for enjoying happy hour in the late afternoon or to take in early evening and late night entertainment along with lots of fun. From the Crow’s Nest walk to the east side of the property to savor a view of the ‘Tween Waters Marina and the resort’s beautiful Bay view. Find the Canoe & Kayak Club near the Boat Ramp, then the bayside Snack Center and the Pelican’s Roost Boutique near the water offering the finest, tropical fashions you’ll want to wear. The last thing to sight on this unwind tour is the picnic table with a thatched roof. This special spot overlooks the ’Tween Waters Inn view of the Bay, and is located near a charcoal grill guests may use during their visit. You’ve now strolled past all the various buildings and secluded cottages on the property. It was a relaxing walk you will likely call on for quick reference during your ‘Tween Waters Inn visit. Best of all you are a short distance from the pool, again. This will work out great if one of you thinks it’s time for a snack or to take a carefree swim. Have fun!